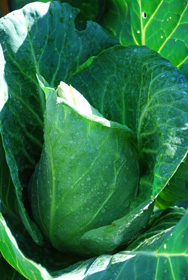 People have been growing cabbage as a staple for thousands of years. Domesticated from a weedy Mediterranean sea kale, cabbage was grown by Greeks, Romans, and pioneers. Cabbage can be shredded into crisp slaws, braised, sautéed, or added to soups and stews, or fermented into sauerkraut or kim chi. 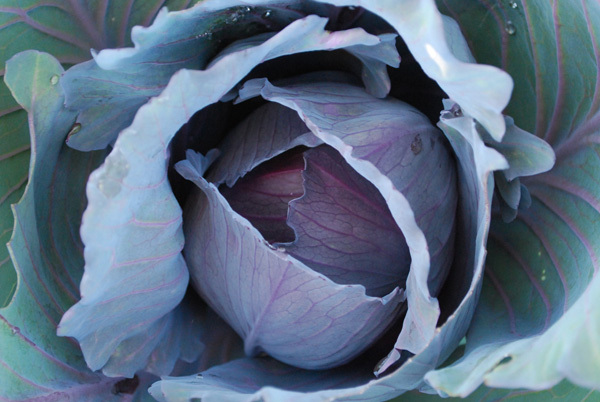 It’s this versatility—and long storage life—that makes cabbage popular among home gardeners. Home grown cabbage is sweeter and crisper than what you find in stores. I like to steam it lightly and serve it crisp-tender, with just a hint of butter and a sprinkling of salt and fresh-ground pepper. When you think of cabbage, the first thing that comes to mind is smooth-headed green (or red) cabbages you see in supermarkets. But there are also Savoy cabbages with puckered leaves, and Chinese cabbages that form open, upright heads. And there are the “Mini” cabbages—small, 1-lb cabbages the size of softballs—that are so popular in European markets. See Cabbage Varieties for more information. Cruciferous vegetables respond particularly well to composted or well-aged animal manure, especially poultry manure. If you’re growing cabbage in the cooler months of spring or fall, choose composted manure or animal-based soil amendments. If you’re growing cabbage in the warmer months of the summer, you can use plant-based organic soil amendments, like alfalfa meal or soy meal. 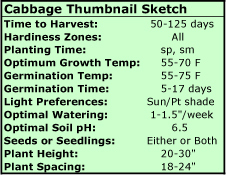 Cabbage thrives in a pH range of 6.5-7. See Changing Soil pH for ways to adjust soil pH. 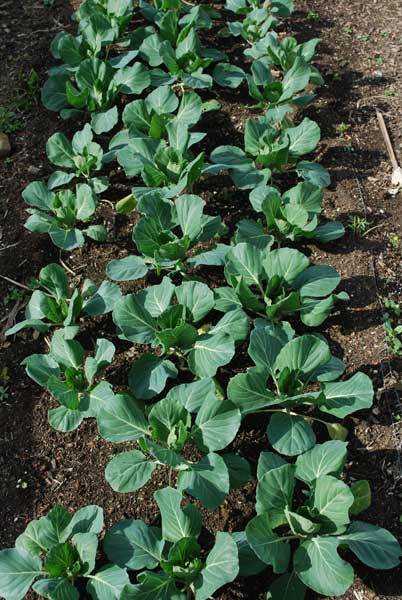 Cabbage plant spacing depends on variety and soil depth. If you’re growing cabbage in a single-dug or roto-tilled garden (soil prepared to a depth of 8-10”–20-25cm), set early- and mid-season varieties in rows 26-28” (66-70cm) apart. 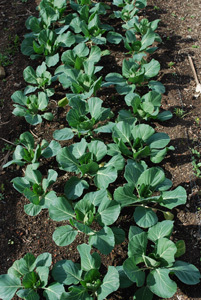 Plant early-season and mini cabbages 14” (35cm) apart in the rows, and mid-season varieties 16” (40cm) apart. Late-season, storage-type cabbages grow larger. Plant them 24” (60cm) apart in rows 36” (90cm) apart. If you’re growing cabbage in a deep-dug or raised garden bed (soil prepared to a depth of 20-24”–50-60cm), plant early-season and mini cabbages on 14” (35cm) centers, mid-season varieties on 16” (40cm) centers, and late-season varieties on 20” (50cm) centers. 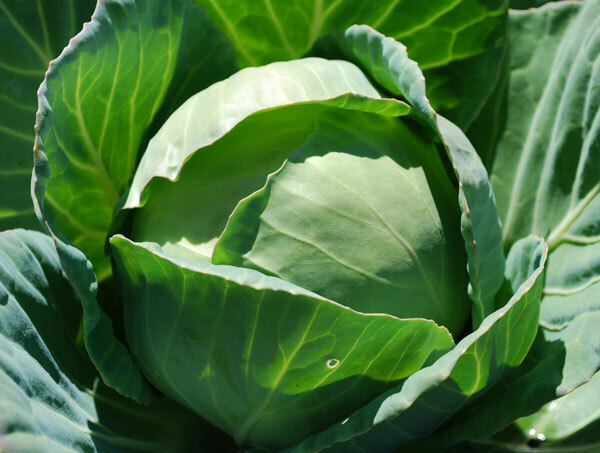 Like fall vegetables in general and cruciferous vegetables in particular, cabbage needs regular water—1-1 ½” (2-4cm) per week—to sustain the steady growth that cool-season vegetables need. Cabbage whites are the adult form of the most notorious cabbage pest, the Imported Cabbage Worm. I used to keep a racketball racket hanging on a peg on my potting bench, and took great satisfaction swatting pairs of them doing their courtship dance over my brassicas. But there are better ways to deal with infestations. Floating Row Covers are one solution. These are thin sheets of light- and rain-porous material that can be thrown over the top of plants, and weighed down on the edges with boards or rocks. If you have a major problem with any cabbage pest—imported cabbage worms, cabbage loopers, cabbage maggots, flea beetles, whatever—floating row covers can exclude the adults that lay the eggs. Soap-and-Oil Sprays are standard part of the homemade garden pest control toolkit. Insects breathe through pores in the sides of their exoskeletons. Soap surfactants cover these pores, suffocating the insects. The oil helps the soap spray stick to the insect. In a gallon sprayer (one that’s never been used for chemicals), mix 1 tsp dish soap and 2 tsp vegetable oil. Shake and mix thoroughly, then spray plants, making sure you cover the undersides of leaves. Garlic Oil added to the mix kills insects more quickly, and also kills insect eggs. The garlic has a residual repellant effect that lasts for several days. To make garlic oil, smash several cloves with the blade of a knife, then cover with vegetable oil in a sealed jar. Leave on a counter for 3-4 days, shaking the jar occasionally, then pour the oil through a strainer into a brown glass bottle. Use the same amount of garlic oil as you would vegetable oil. Store garlic oil in a cool, dark place, and it will last 2-3 months. 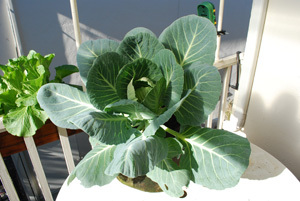 See Cabbage Companion Plants for planting strategies to minimize these and other pests. Wasps, yellow jackets, and hornets are predators, and parasitic wasps attack their eggs and larvae. See Natural Garden Pest Control for more information. 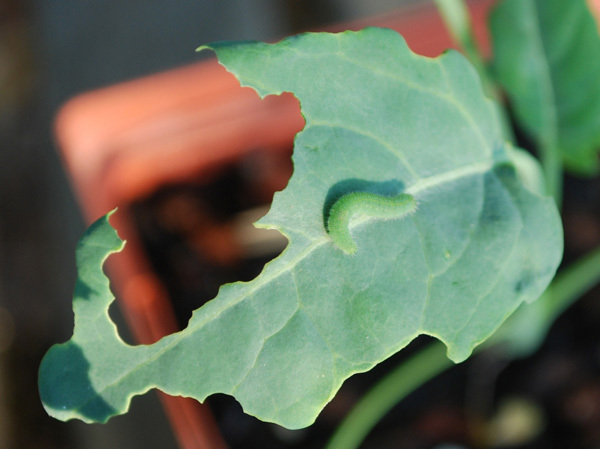 Cabbage Loopers are another common pest you’re likely to see when growing cabbage. Like inchworms, they “double up” to move across a leaf. They’re the larval form of a nondescript brown moth you’ll probably never see. In large numbers, they can do a lot of damage. The same measures used against imported cabbage moths will work against cabbage loopers. Cabbage Maggots are white fly larvae about 1/3” (1cm) long, that feed on stems around the base of the plant. They’re usually not a problem for most home gardeners, but in areas where they are, they can be controlled with floating row covers, or by scraping the soil away from the base of the plant and mixing in a tablespoon or two of wood ashes. Press the soil-and-ash mix back around the base of the plant and water in. As long as you’re growing cabbage in a healthy soil, you’re unlikely to see many cabbage diseases. 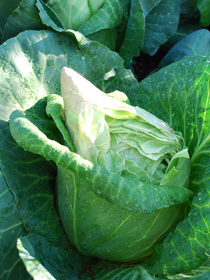 Cabbage is subject to Fusarium Yellows, Club Root, Black Speck and Black Rot. Fusarium and club root are fungal diseases that build up in soils. When growing cabbage, rotate cruciferous vegetables to different beds every year to deny hosts, and plant resistant varieties. ‘Kaitlin’ is resistant to fusarium yellows. Raising soil pH to 7.3 can inhibit club root. Most fungal pathogens are weak competitors in the diverse soil ecosystems supported by soils with a lot of organic matter. Black Speck usually shows up in cabbage that’s been cold stored for a while. Small, dark blotches appear on the leaves. Resistant varieties are available. Adequate potassium levels can inhibit black speck. Greensand is a good, long-lasting potassium source for organic gardens. Black Rot is a bacterial disease that can affect most cruciferous vegetables. The infection can be systemic, affecting the whole plant, or local, forming a characteristic V-shaped blotch of dead tissue with the wide end at the leaf margin and the narrow end toward the middle of the leaf. Since it usually enters plants through injured leaves, avoid working in the garden when foliage is wet. Splitting can be an issue when growing cabbage. Split cabbages lose flavor quickly and store poorly. Splitting is more prevalent with fast-growing, early varieties, but it can happen to mid- and late-season cabbages as well. It usually happens when heavy rain or irrigation follows drought stress. Mulching helps even out soil moisture levels, and reduces stresses on the plants. Timely irrigation also helps. If you know it’s going to rain in a couple of days, the temptation is to not water, but when growing cabbage, this hesitation can get you into trouble. Dryness stresses the plant, but then abundant water creates a surge of growth that splits the head. If your cabbages have headed up and heavy rain is forecast, you can prevent splitting by severing some of the feeder roots on one side of the plant with a spade. Cut vertically into the soil on one side of the plant, about 10” (25cm) out from the base of the plant. A couple of spade-width cuts should sever enough feeder roots to minimize the risk of splitting with heavy rain. Since you're going to be harvesting in a few days, the root damage is inconsequential. Alliums (onion family plants), Umbellifers (carrots, dill, fennel), and herbs (cilantro, oregano, hyssop) are all good companion plants when growing cabbage and other cruciferous vegetables. Alliums and herbs release aromatic compounds that mask the scent of cabbages, making it harder for pests to find them. Umbellifers are key plants in Natural Garden Pest Control and Attracting Beneficial Insects. Cabbage can be grown in containers, as long as you select a deep container or pot and build organic fertilizers into the potting mix at planting time..
Cabbage needs at least a 12” (30cm) root zone to form heads when grown in containers. A deep window box (1 foot wide x 1 foot deep, and 2-4 feet long–30cm x 30cm x 60-120cm) or half wine barrel is an excellent choice for growing cabbage in containers. For the warm season, use worm castings, alfalfa meal, soy meal, or any animal-based organic soil amendment. Select ‘Mini’ or compact varieties like ‘Gonzales’, ‘Savoy Express’, or ‘Red Express’. Don’t overcrowd plants. I know the temptation is to plant the whole 6-pack of seedlings, but don’t do it, unless you’ve got a minimum of 6 cubic feet of container space to devote to them. Harvest cabbage when the heads have closed and the wrapper leaves are still in good shape. If the wrapper leaves are yellowing or blotchy, the cabbage has stood too long in the field and won’t last as long in storage. Cut the heads off at the base of the plant, and leave 2-3 wrapper leaves to help protect the heads from bruising or damage. Early varieties keep for a few weeks in the vegetable crisper or root cellar. Mid- and late-season cabbages can keep for a few months. One really healthful way to preserve cabbage is Lactic Acid Fermentation—making sauerkraut or kim chi. Lactic acid fermentation preserves the vitamin C and produces a crunchy, delicious home-made probiotic that’s great for digestion.